The Chinese regime has adopted a two-child policy, but the local school authorities in a province in central China are still making it nearly impossible for female teachers to have a second child. “If you don’t follow the school’s birth control regulations, the school will move you to a new position,” said Jia Hongbin, a union director responsible for birth control measure at Zhongmu No. 1 Senior High School in Henan Province, in an interview with Henan Television on April 3. “And if you get transferred to another work unit, there will also be risks,” Jia added. This is a school, not a place to have a second child. Union director Jia’s statement was no idle threat. A six-month pregnant former teacher at the high school told Henan Television that she was reassigned to work in the school’s supermarket because the school had already hit the pregnancy quota by the time she was expecting. “The school is already finding excuses to get rid of some teachers,” the unnamed teacher said. Ms. Zhang, a teacher at the school, said that only 16 teachers were allowed to have a second child in the first school semester of 2016, and an additional 15 others in the second semester. 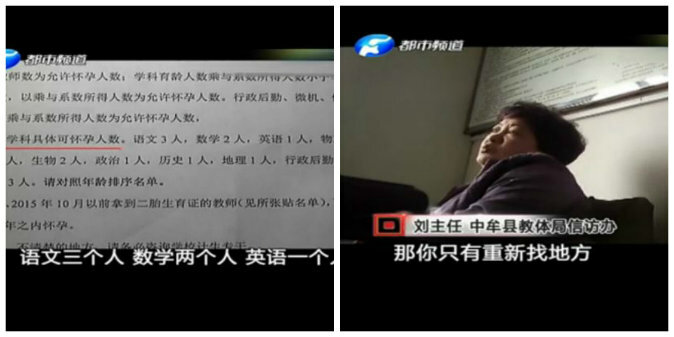 The quota, according to documents Mr. Zhang showed Henan Television, was determined by teaching subject, and older teachers would be given priority over their younger colleagues. “Younger teacher will need to wait for about five or six years for their turns” said Ms. Zhang, adding that school administrators warned female teachers at the school that they could be fired if they were found to be pregnant outside the allotted time frame. And if a teacher can’t conceive within the set time frame, “she would be stripped of her right to get pregnant,” Ms. Zhang added. In addition to verbal threats, the school had also asked its female teachers to have a pregnancy check-up once every three months, another female teacher told Henan Television. When asked if the school regulation had violated the national two-child policy, Jia Hongbin the birth control director said that even if there was a violation, it couldn’t be helped because they could not possibly keep the school running if its female teachers kept on getting pregnant. Zhongmu No. 1 Senior High School is not the only school in Henan to impose a pregnancy quota. Xin Pu Jie Elementary School, also in Zhongmu County, has a total of four openings for its teachers to have a second child every year, according to a teacher interviewed by Henan Television. “The queue stretches into the 2020s,” said the teacher. In February, a female teacher at Shang Bo Elementary School in Henan Province had to pay a fine of 800 yuan (about $123) before being made to resign from her job because she broke similar birth quota regulations. The Chinese regime isn’t taking care of China’s millions of “orphan parents,” and they are increasingly speaking out about their plight. With all the talk surrounding International Women’s Day this week, it is important to remember the many women of China. Rudong County won a top award in 1986 for hitting the regime’s population control target. Today, the county is facing the consequences.